Preliminary climate attribution analysis done by a team of international scientists makes it clear that it is virtually certain that climate change increased the likelihood of the July 2015 European heatwave subjecting much of central Europe to elevated temperatures. Climate scientists from the Royal Netherlands Meteorological Institute (KNMI), the University of Oxford, CNRS, and MeteoSwiss examined the likely influence of global warming. The team was convened by Climate Central. "A statistical analysis of the observations shows that the probability of observing such a heat wave has more than doubled over the past 37 years in most of the affected region. In the selected cities the increase is even stronger." says the Climate Central report. The scientists looked in particular at 5 European cities comparing the odds of the current heatwave event with model runs undertaken without major greenhouse gas pollution. The cities were De Bilt in the Netherlands, Madrid in Spain, Mannheim in Germany, Paris in France, and Zürich in Switzerland. As multiple definitions are used for heatwaves, the team settled on a definition as the average of the maximum temperatures over 3 consecutive days. A combination of observed and forecast data was used for the analysis. 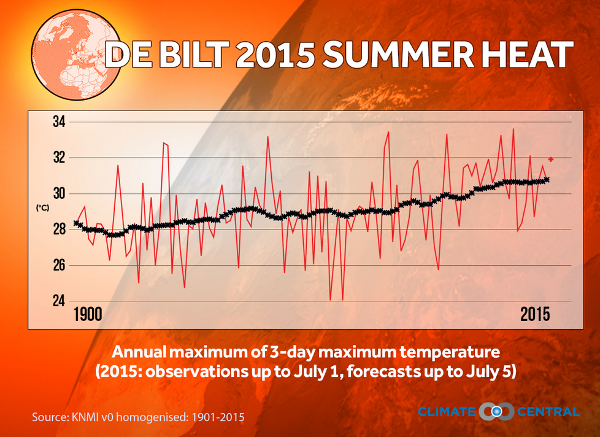 "In De Bilt, a 3-day period as hot as forecast these days was a roughly 1-in-30 year event in the 1900s. It is now likely to happen roughly 1 in 3 years. 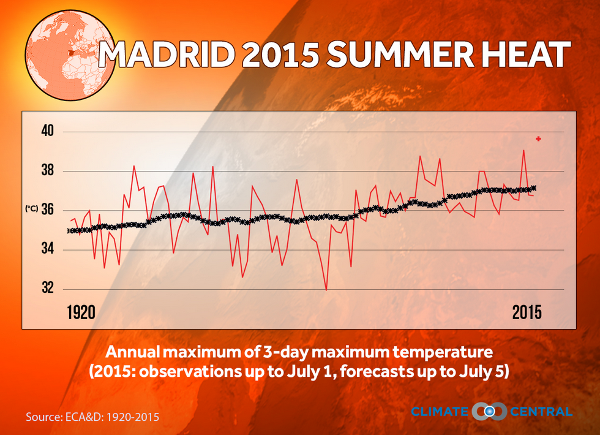 In Madrid, a 3-day period as hot as forecast for the next few days would have been exceptionally rare in the 1920s. It is now likely to happen roughly 1 in 40 years. 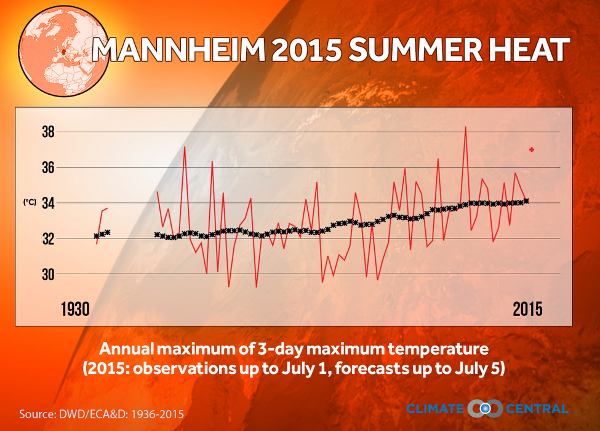 In Mannheim, a 3-day period as hot as the last few days would have been a once in a century event in the 1900s. It is now likely to happen roughly 1 in 15 years. 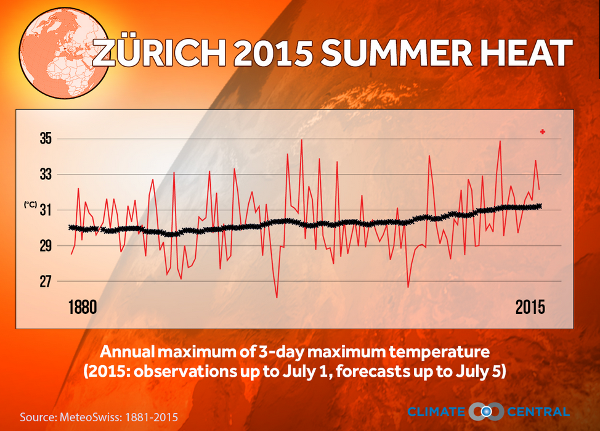 In Zürich, a 3-day period as hot as forecast for the weekend would have been a 1-in-350 year event around 1900. It is now likely to happen roughly 1 in 70 years." The team of scientists at Oxford used the weather@home decentralised computer processing simulating the likelihood of seeing days as hot as as those Europe is experiencing now. The results in the 5 cities analyzed were that current conditions are now at least twice as likely due to climate change, not including urban effects. 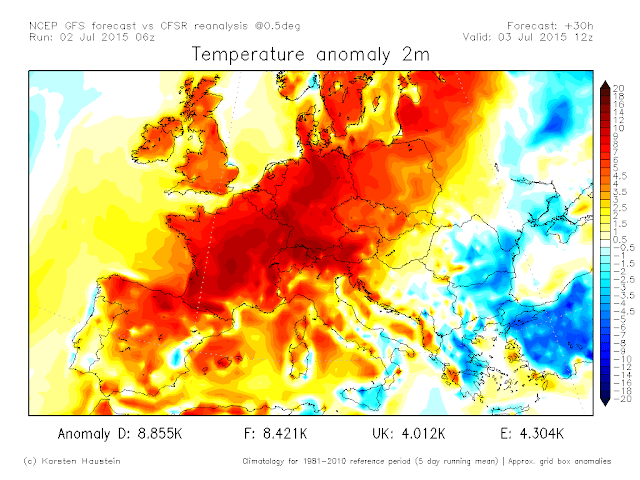 "For De Bilt, 3-day maximum temperatures as hot as this summer are expected roughly once every 6 summers while they were only approximately a 1-in-13 summer event in the model world without global warming. "For Madrid, 3-day maximum temperatures as hot as this summer are expected roughly once every 19 summers while they were only approximately a 1-in-120 summer event in the world without global warming. For Mannheim, 3-day maximum temperatures as hot as this summer are expected roughly once every 16 summers while they were only approximately a 1-in-50 summer event in the world without global warming. "For Zürich, 3-day maximum temperatures as hot as this summer are expected roughly once every 45 summers while they were only approximately a 1-in-190 summer event in the world without global warming. Data for Paris was pending, according to Climate Central. So, using two research methodologies scientists have concluded that it is virtually certain climate change has increased the likelihood of such an extreme heat wave event. This is in accord with widely accepted research that climate change will in general increase the frequency, intensity and duration of heat waves (Meehl and Tebaldi, 2004; IPCC, 2014). Scientists from the Potsdam Institute for Climate Impact Research have also highlighted the present heatwave link to climate change.